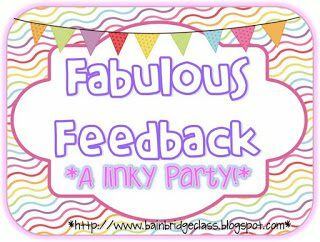 When I heard the idea for the Fabulous Feedback linky, I was all over it. I mean, I get an opportunity to showcase and share the nice things people say about what I pour my heart and mind over to create? Who wouldn’t want to do that? And, honestly, we get some interesting feedback, and interesting might not even be the right word, so getting a chance to show the good stuff is great. It’s not easy for anyone to accept constructive criticism, and I’ve learned teachers are even more bothered by it, but it’s the name of the game. So, I try to accept each and every quality feedback I receive, learn from it, and improve my creations. Thank you for taking the time to leave worthwhile and quality feedback. It helps the sellers hearts and, at times, helps improve them too. Here is some feedback that warmed my heart well. If you’d like to check out the other Fabulous Feedback posts, check out the linky below! I hope your school has some fantastic goodies lined up this week!